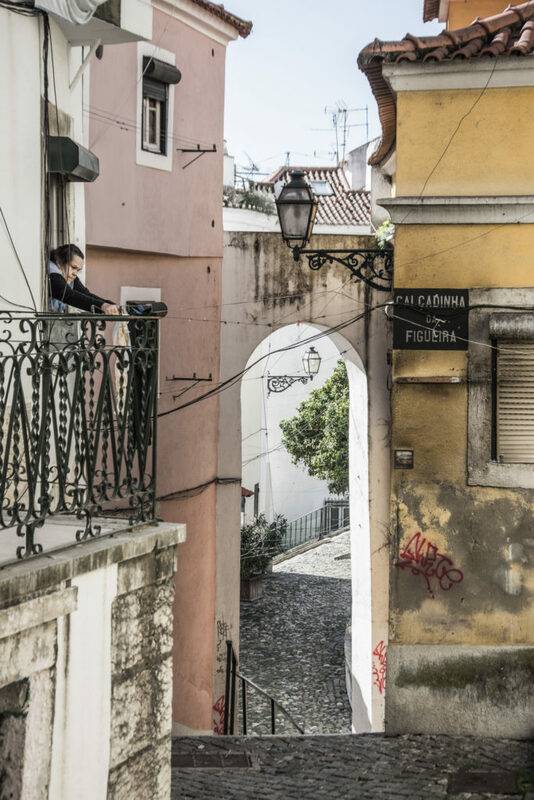 One of my best experiences I had in Lisbon, was definitely the photo walk in Alfama with Miguel, the leading photographer from Lisbon Photo. We met early morning at Cais das Colunas, from where we started our 4-hour photo tour. 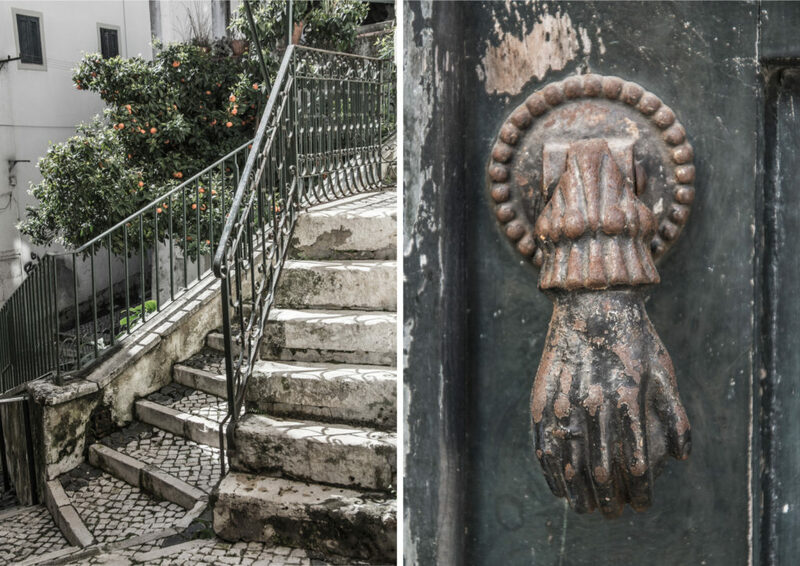 Being an enthusiast professional who knows the city pretty well, Miguel showed me some hidden places and excellent spots and angles to shoot from, which I would have never discovered staying in Lisbon for just a few days. We first passed by the Lisbon´s Cathedral. 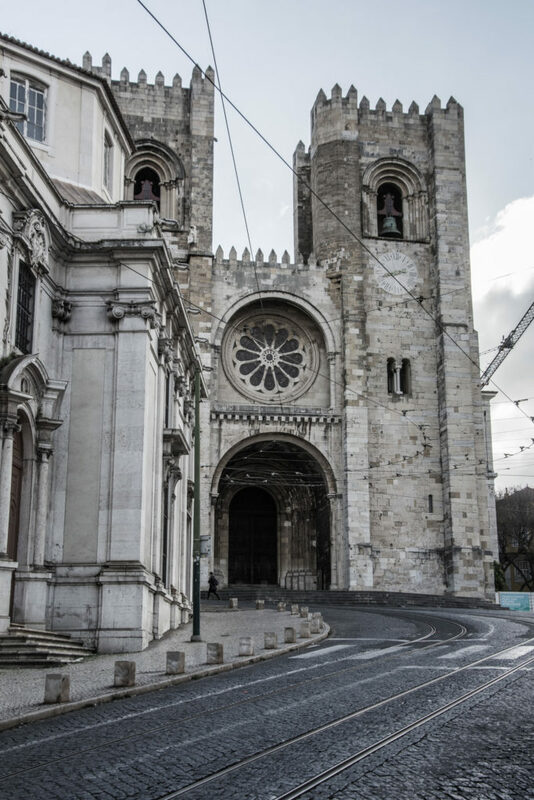 It is the oldest religious building in Lisbon. 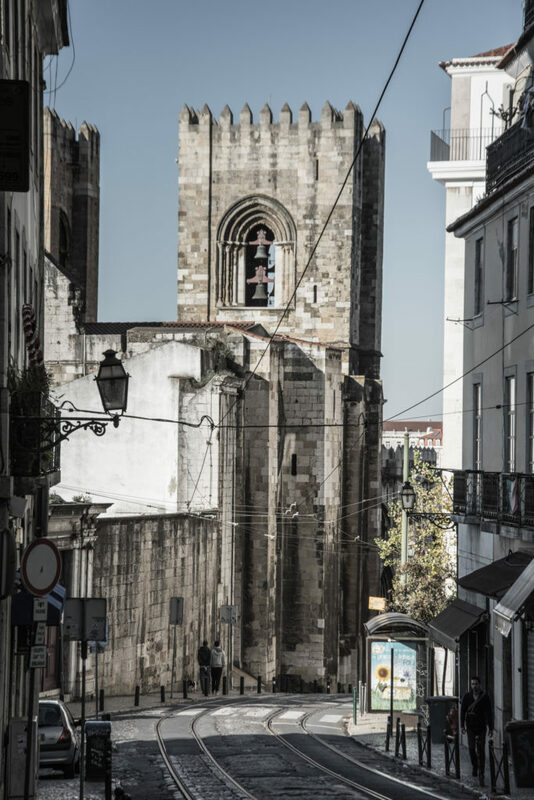 It was built by the first King of Portugal in the 12th century on the foundations of a former mosque. 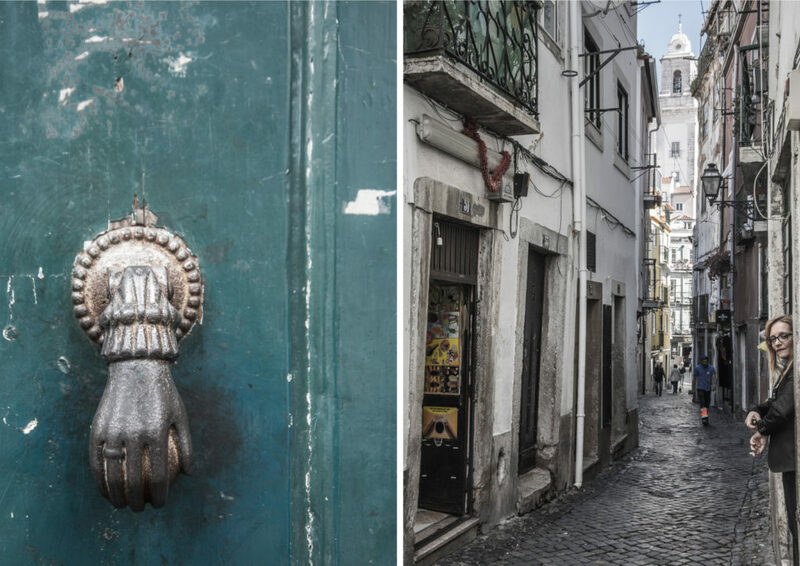 It belongs to major sights of not only Alfama, but also of the whole Capital. 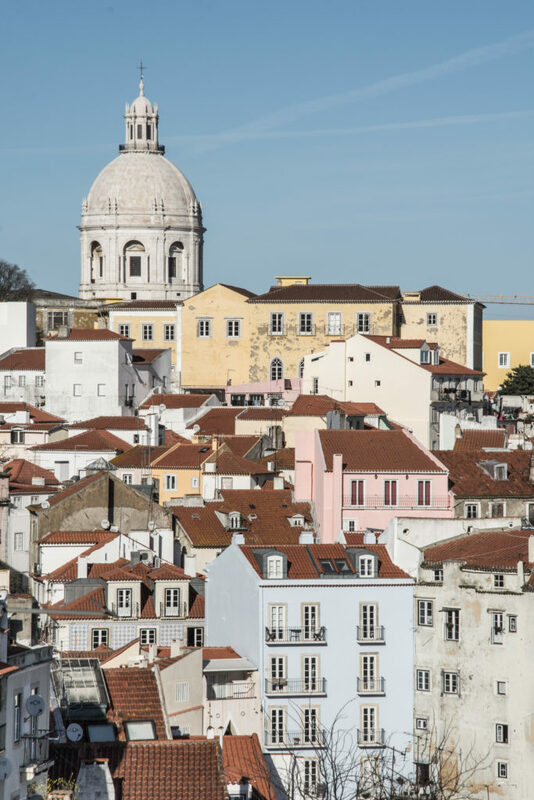 From Miradouro de Santa Luzia you can have a nice view of Alfama with white dome of the National Pantheon. I loved this place for pictures during late afternoon although it was well crowded by that time (the below picture was taken around 4 p.m.). During the walk from the Cathedral to another viewpoint Miradouro das Portas do Sol from where you can have another nice view of Alfama, we were trying to get some nice shots of the famous yellow tram 28 which connects Graça and Baixa through Alfama. This was a challenge as many of these trams are covered with publicity plus the light already threw some strong shadows in the streets. Although, good things come to those who wait! 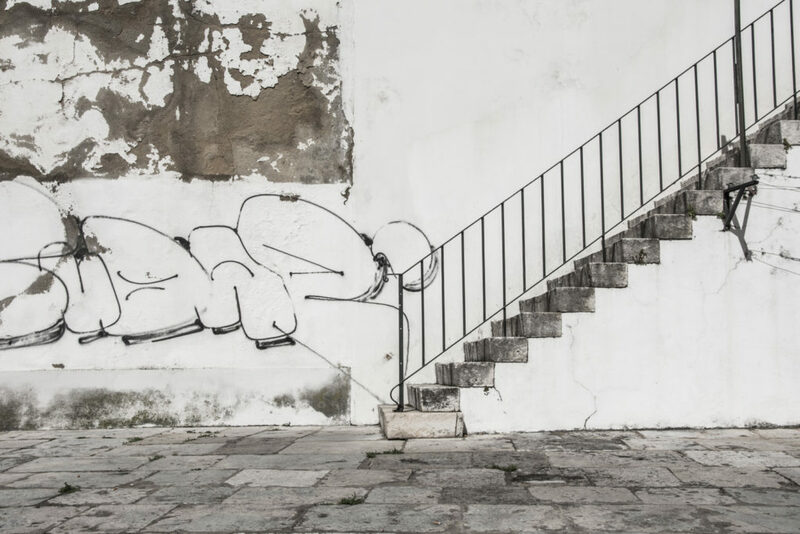 🙂 There are also some nice street art pieces in Lisbon. 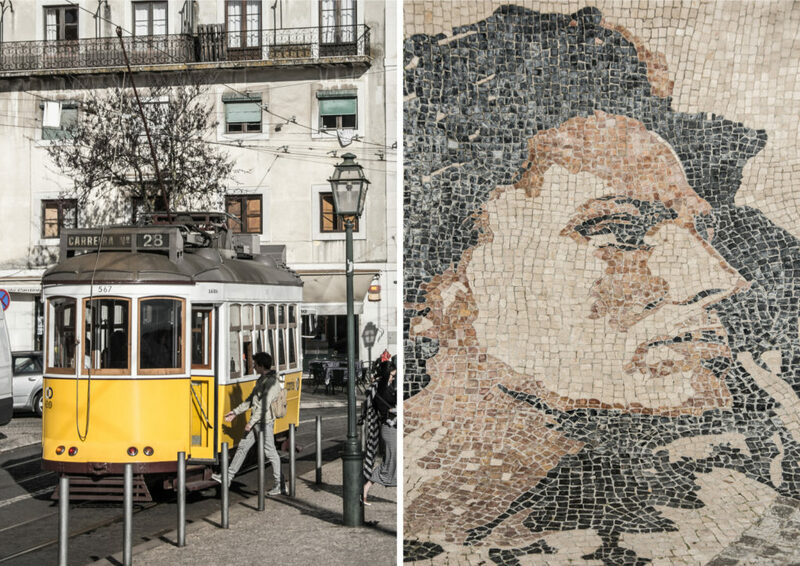 One of them is a mosaic portrait of Amália Rodrigues – the famous Portuguese fado singer. 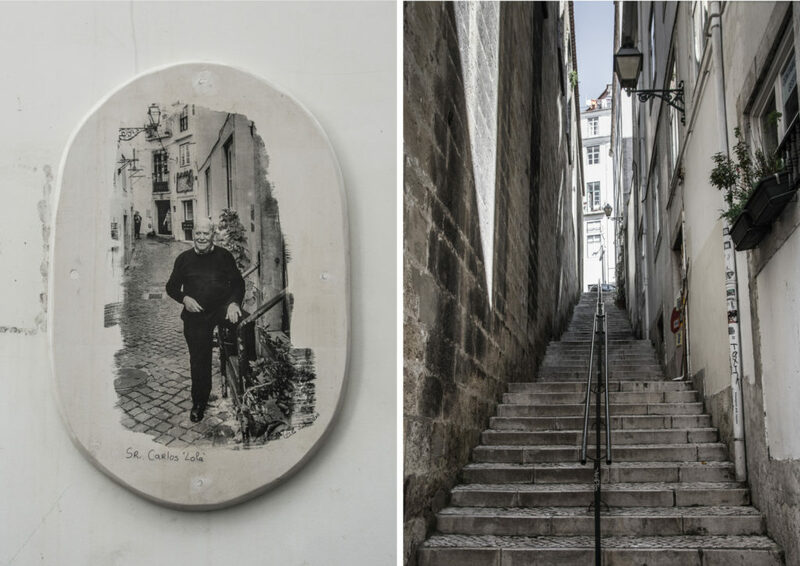 After these shots, we turned downhill to discover the real Alfama, wandering in its calm narrow lanes and observing the life. 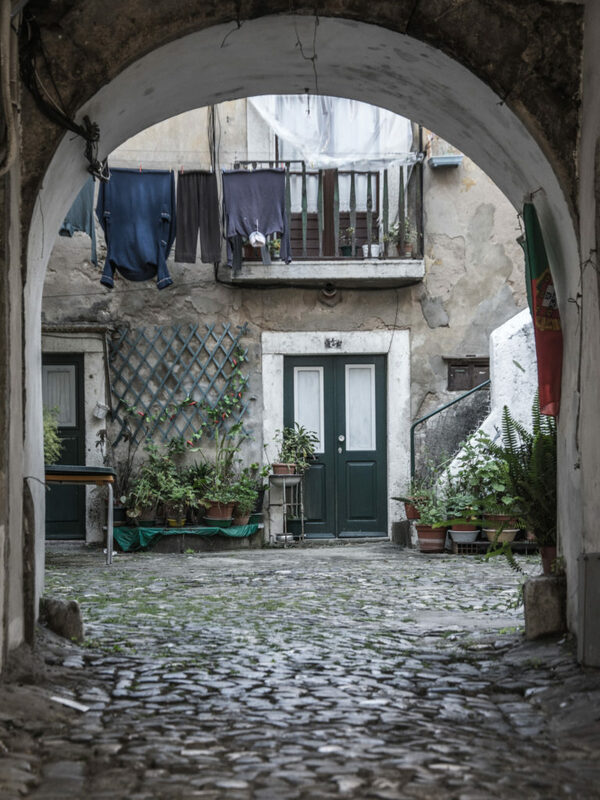 Alfama is the oldest district of Lisbon, a maze of narrow and cobblestoned streets that spreads between the Castelo de São Jorge and the Tejo Estuary. The district was inhabited by the Moors between the 8th and 12th century and by that times, it was a poor district behind the city walls. They gave Alfama its original name ‘Alhama’ which comes from an Arabic word meaning spring or bath that were found here. 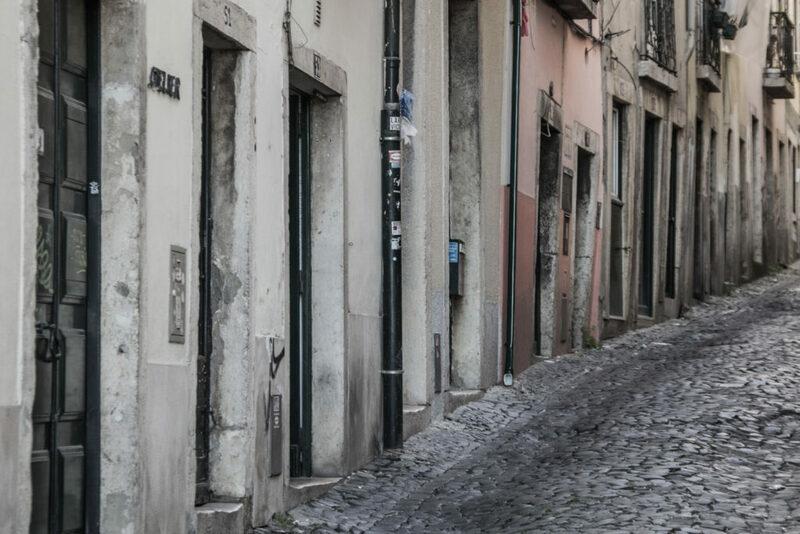 And as Alfama was one of the few districts that survived the bad earthquake in 1755, you can still see some Moorish features of the local architecture even nowadays. 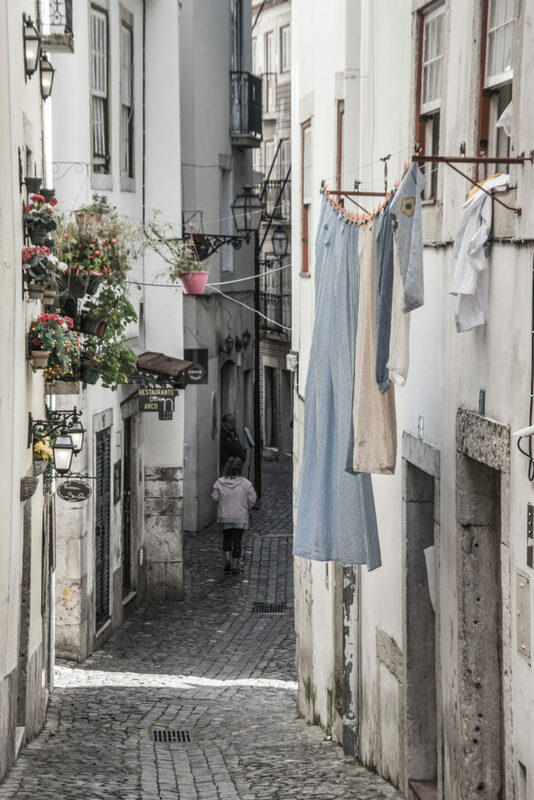 What is nice about Alfama is that it is the kind of a place where the time has stopped and people have still been living the traditional way of life. 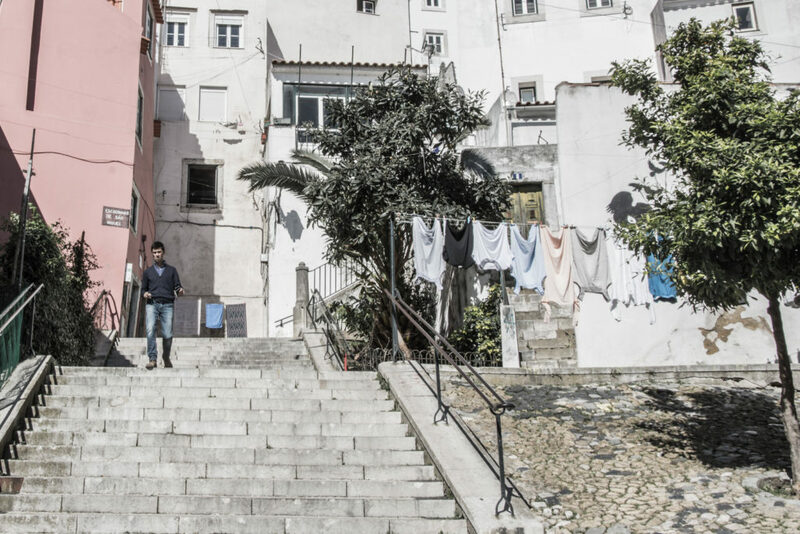 Some of them have been living here since they were born and so there is a strong sense of community. People talk to each other in the streets, sit in the open windows and outside, wash their clothes on public places which is a kind of socializing for them, they leave drying laundry hanging out of their windows and balconies and it might even happen that they invite strangers home like somewhere in a small village… And so this part of the city has kept its unique charm, even though it is now being slowly restored with young people and foreigners moving in. 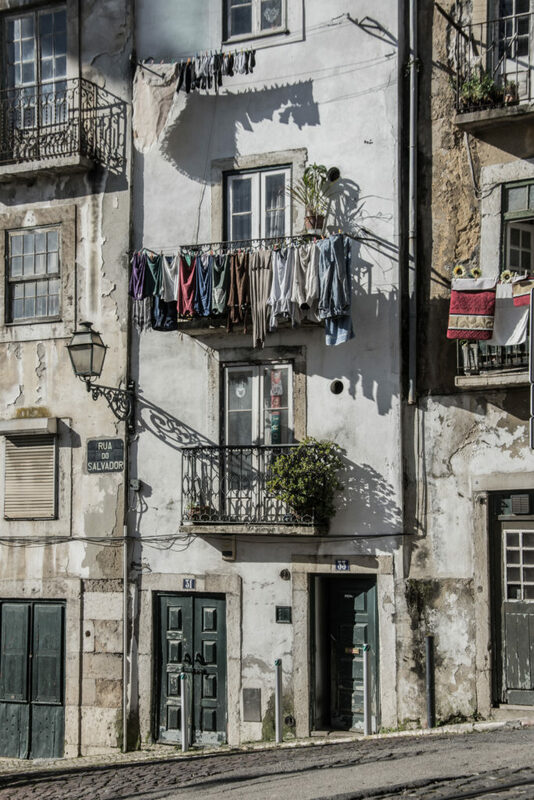 Narrow cobbled streets, staircases going up and down, street lamps, pastel-colour facades of local old houses, trees, drying laundry hanging from the windows and balconies, elder ladies in the windows… welcome to the beautiful Alfama! 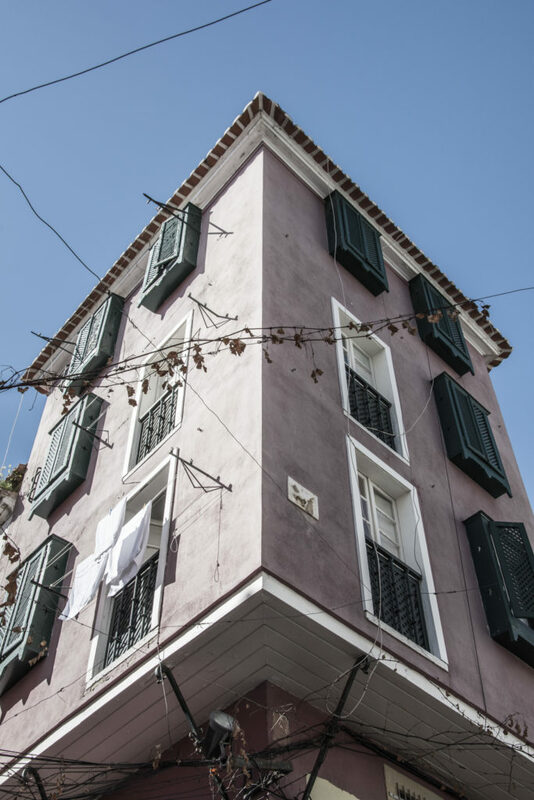 On the below picture, you can see window boxes which is a feature common to the houses in the North African countries. But in Alfama, this is a relic from the Moorish times. 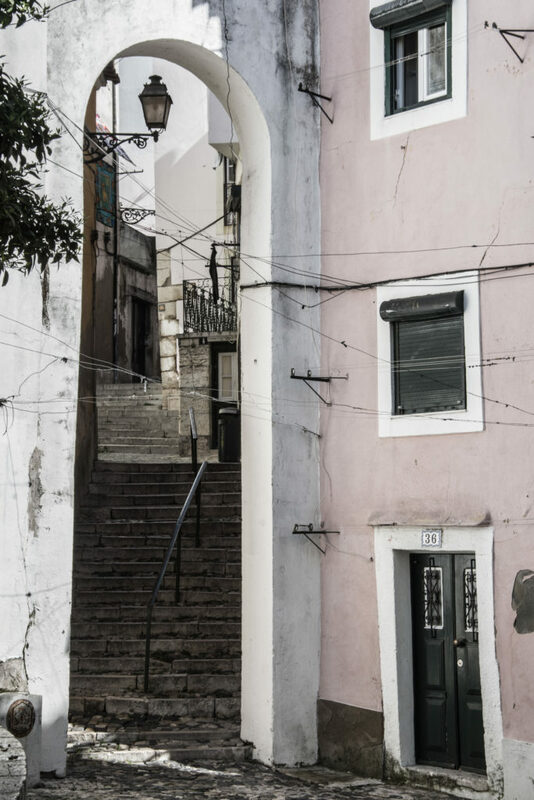 Another common feature of the houses in Alfama is the enlargement of the first floor, in order to make the narrow streets wide enough for people passing by. 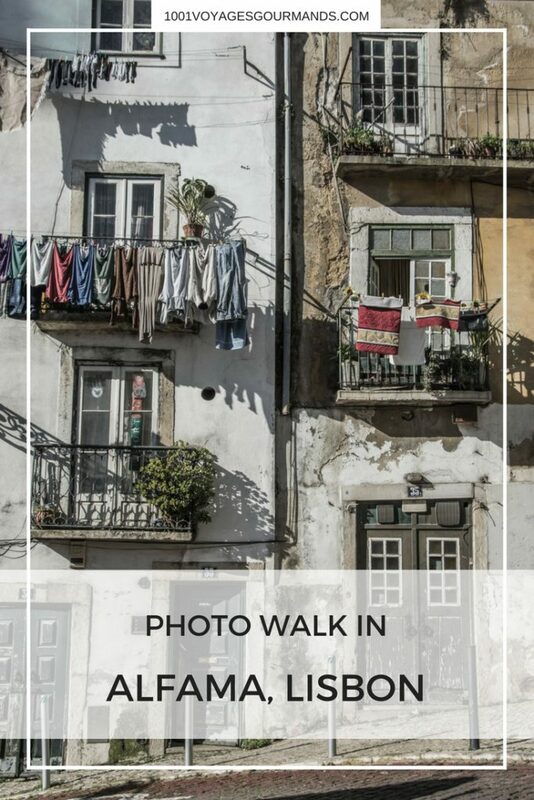 To sum up, I had a great time during this 4-hour walking photo tour through Alfama and I would recommend Lisbon Photo to anybody who is interested in photography and coming to Lisbon. Miguel is a professional who can smoothly transfer his enthusiasm and experience to others while you have an impression walking with a friend and I love to recommend such people! (Please note that this is not a sponsored post and therefore an independent recommendation based on my great experience!). 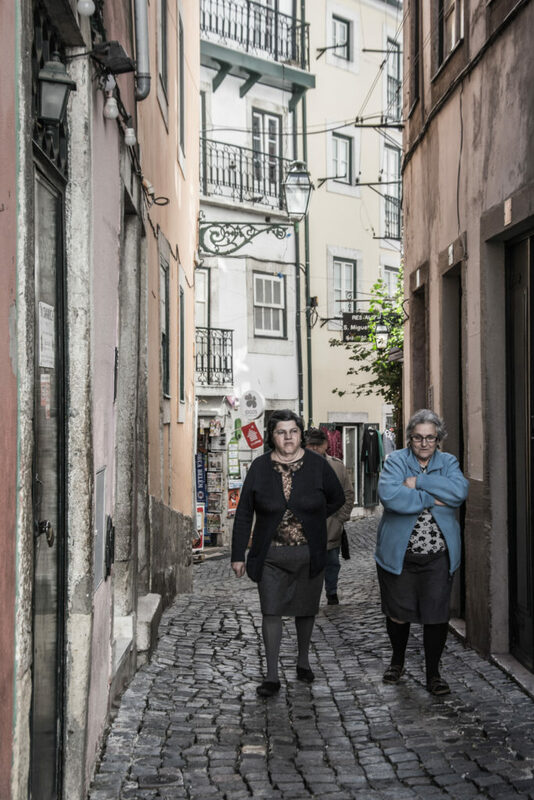 I had this photo walk on my second day in Lisbon and therefore I could have benefited from the tips Miguel gave me for the rest of my stay in the city. I would like to thank Miguel once more for giving me some useful tips and guidelines for the future of my photography. 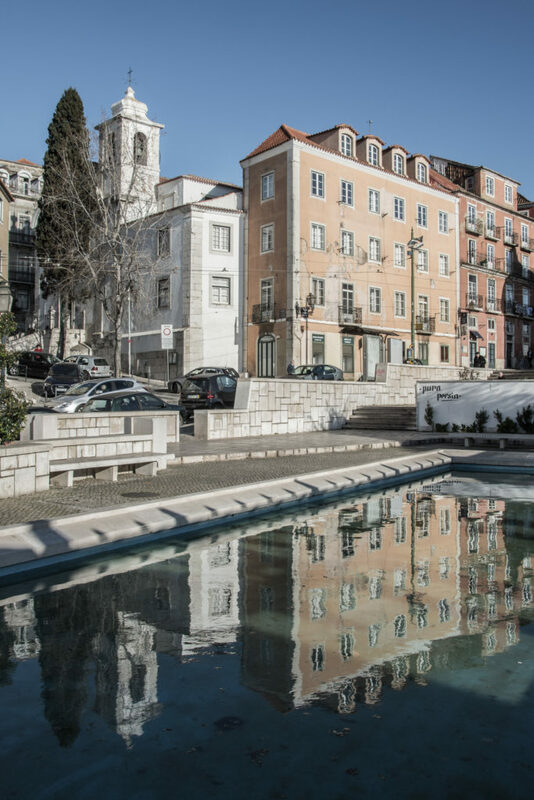 For more information, visit the website of Lisbon Photo. 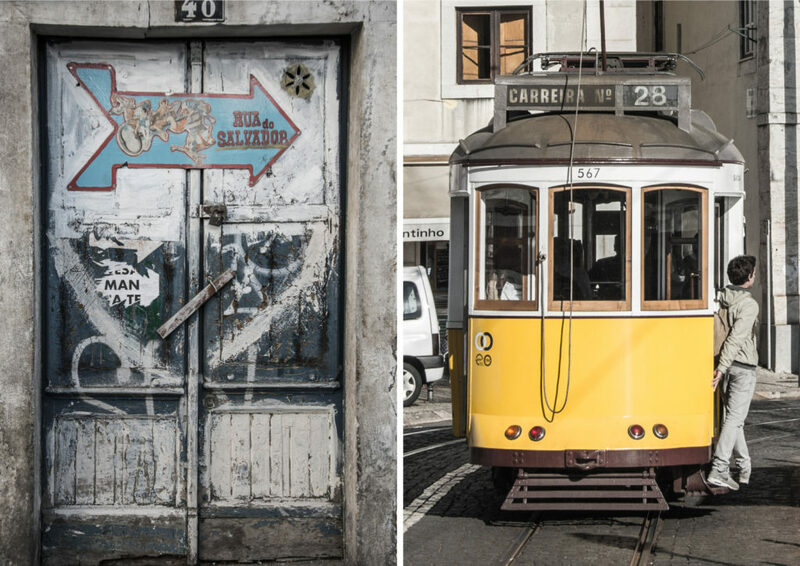 Have you ever visited Lisbon? 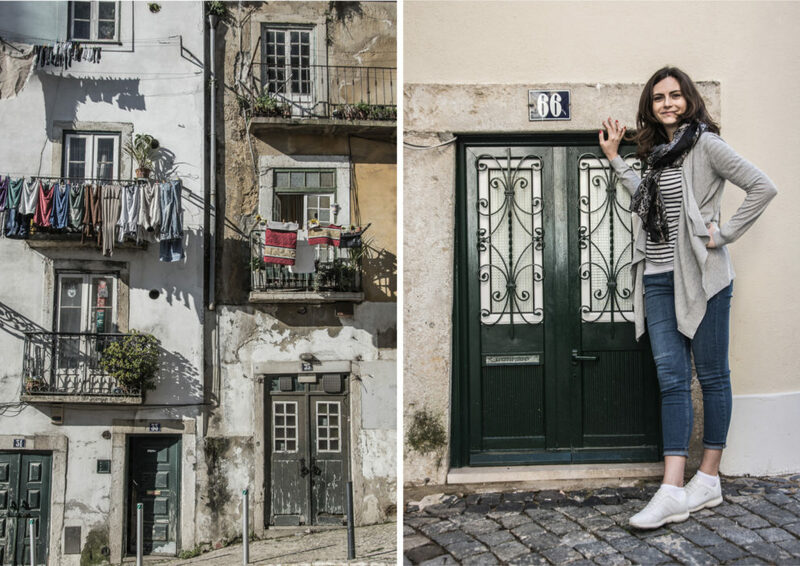 How did you like Alfama? Have you been there in June? Tell me more in the comments below! If you liked the post, please share it on social media! great pictures! 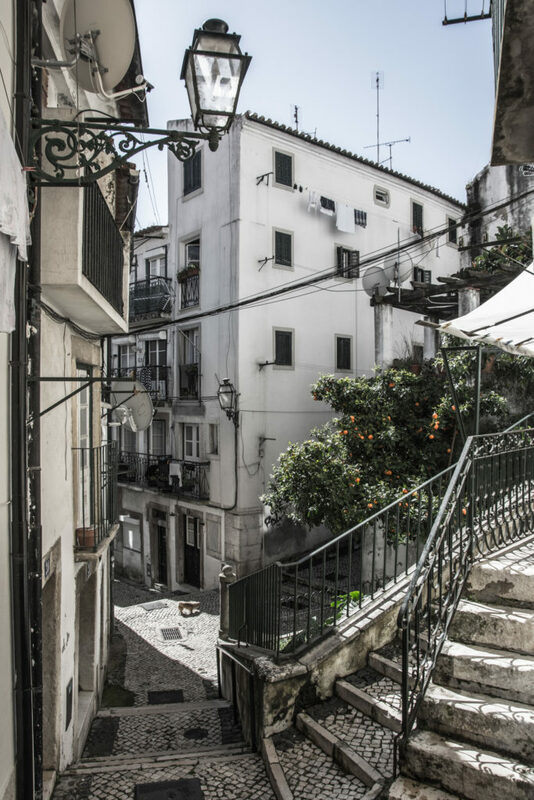 I love the Alfama… it feels like time has stopped like you said! it is so traditional… when I was there I had the feeling some people living there had almost never left that neighborhood! Your photos are absolutely exceptional! I love the tones. 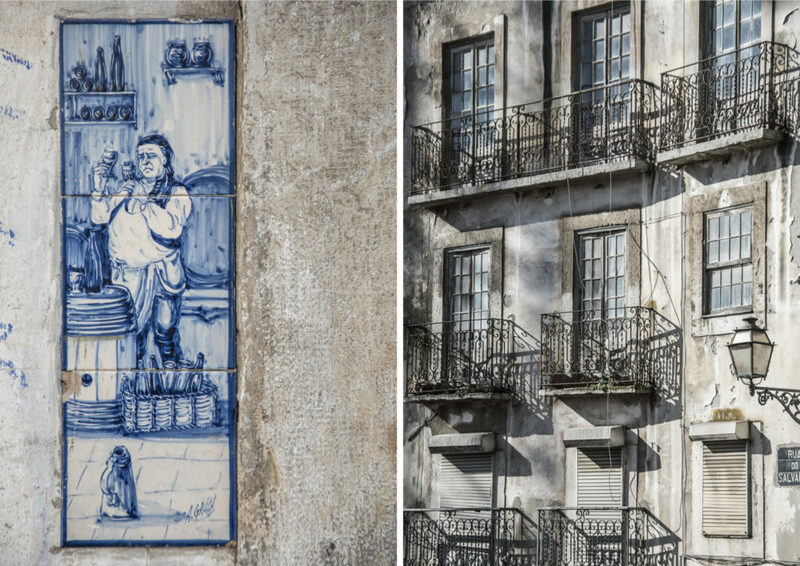 I was in Lisbon just last November and you really captured Alfama’s beauty! This is making me so nostalgic for my Portugal trip last year! Beautiful photos! Your photos are beautiful you should definitely print some up and frame them! Lisbon has some beautiful architecture. I have some good memories of traveling there with my big “sis” a few years ago. 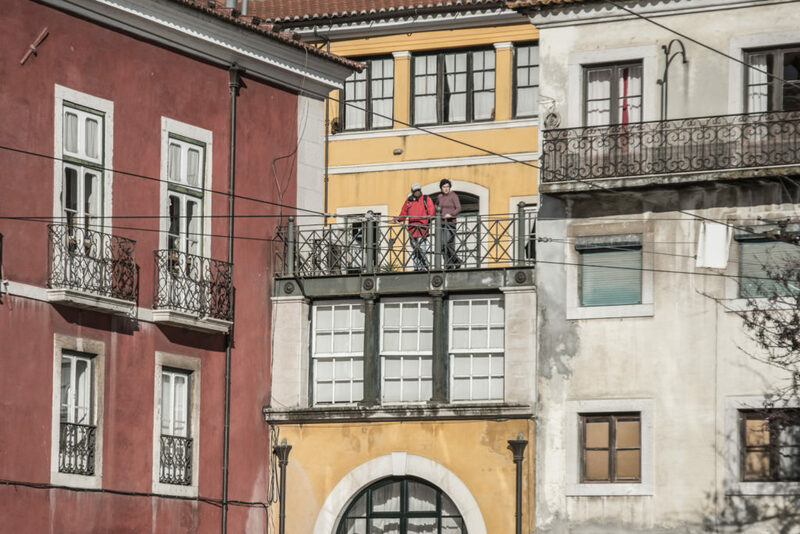 Looks like a fun trip – I love the shot with the laundry hanging on the terrace, and the shot of the couple with the yellow shoes… it really captures the feeling of hiking around the city. Awesome! Such a beautiful photo post! 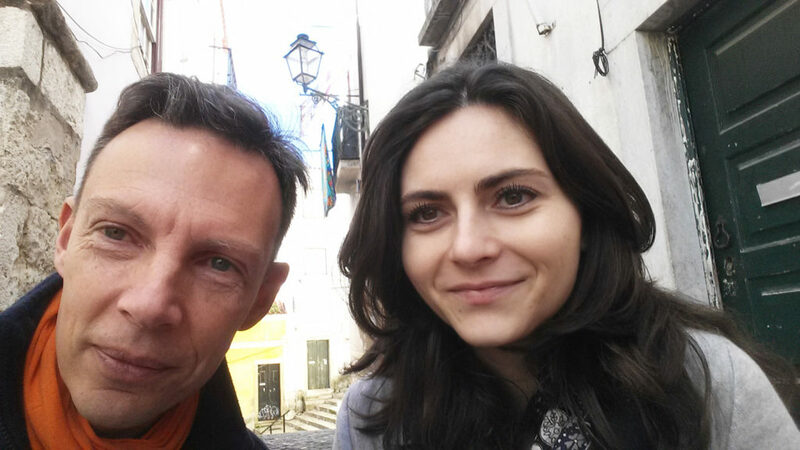 I was in Lisbon in December and I lived in Alfama so I took walks around there every day. It’s hands down the most beautiful part of the city. I wish I had taken more photos, yours are stunning! Beautiful pictures. 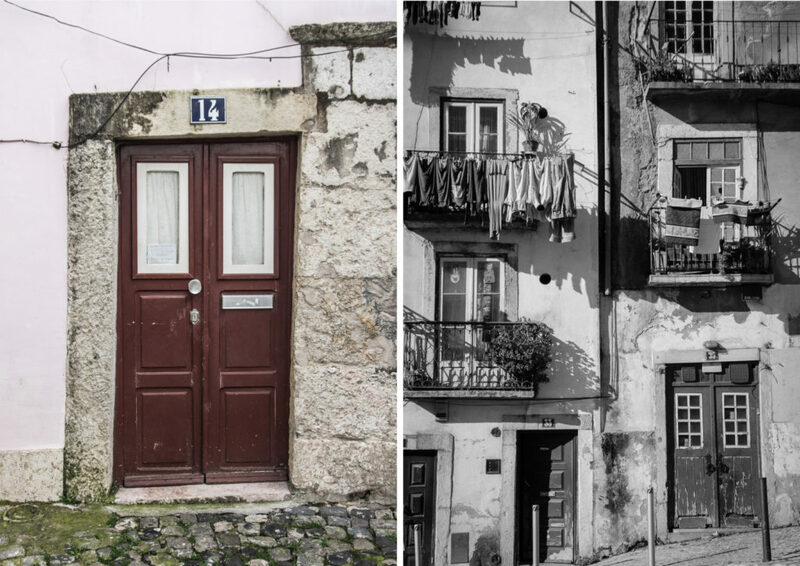 Your pictures taken me virtually to Alfama.